We Are Manufacturers of Hydraulic Bending Machine. Manufacturer & supplier of Hydraulic Bending Machine. These Bending Machines are made from excellent quality raw materials which ensures high durability at its user ends. These machines are appreciated for their durability, higher performance, precise functions and easy operations. We offer Hydraulic Bending that are precision in their performance. Through our unique design, appropriate material selection and innovative technique, we export excellent quality sheets as per customers requirement. The products deliver peak performance and are widely demanded for various industrial applications. 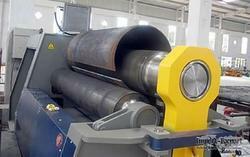 We are engaged in offering wide collection of Hydraulic Sheet Bending . We manufactured and trade these machines to our clients at superior range. These banding machines are fabricated from high quality materials and mostly used by our clients. These hydraulic sheet banding machines are easy to maintain and easy to operate.